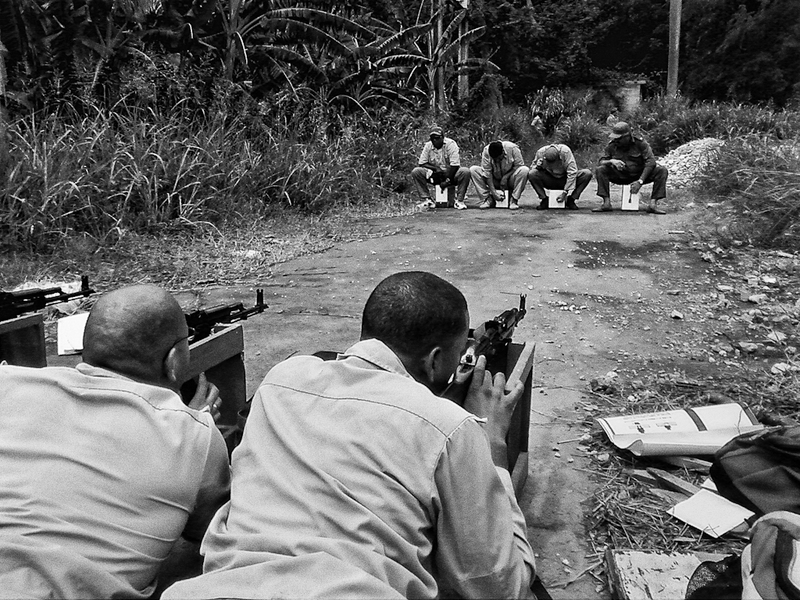 Fifty-two years after Cuba last came under attack, its government maintains a policy called All People’s War. Inspired by Cold War policies, All People’s War dictates that in the case of a foreign aggression—implicitly the threat is from the USA—every Cuban citizen will have an active role to play in repelling the invasion. I, like all Cubans, grew up coached in this policy. We were all waiting for the day when the Americans attacked Cuba. As small children, we practiced evacuation drills, running into air raid shelters to the sound of sirens. Military preparation classes in high school taught all students to shoot small caliber rifles, throw grenades, and camouflage ourselves for guerilla resistance. Afterwards came a year’s mandatory military service and then incorporation into the army reserve. The military is a lurking presence in all our lives. This photo essay manifests that presence through stealthily taken images of a Reunion de Estudios Militares [REM, i.e. Military Studies Call-Up]. These are regular, massive reserve mobilizations to undertake military exercises. They aim to form a primed, homogenized entity from all kinds of people from diverse origins and occupations; the mobilized are automatically excused from their normal jobs whether they are brain surgeons or street sweepers. My platoon comprises guys from my neighborhood. The community’s most acclaimed drunk commands our entire company. Most of the men submerge themselves in a REM call-up like children playing at war games. The indoctrinated threat of imminent attack no longer carries the impact it had years ago. Now it’s just grown men playing with AKs, hoping time will pass quickly so they can return to their normal lives. The young are particularly disaffected, estranged from the defunct principles of times passed. Of all my photographic work, this project is the one I keep coming back to because its nature has defined the person I am today. What I’m looking for in their faces is something that makes them more than the “uniformed totalitarianism force” fighting a cold war that’s long forgotten. These photographs were taken in Havana May 2010, using a cell phone. I really shouldn’t have been taking photos there, I was suppose to be learning to repel the capitalist enemy – you’ve got to laugh. Born and raised in Havana, I lived there until January 2014 when I moved to Sydney. In fact I never had permission to leave Cuba at all until the travel laws changed in January 2013. My first visit overseas trip was to Sierra Leone, via London, to photograph and film ‘They Are We’. Sergio Leyva Seiglie is a photographer based in Sydney, Australia. Born in Havana, Cuba, after majoring in Software Engineering, he soon turned to photography and never looked back. At first self-taught, he later received a degree in Press Photography from the Instituto Internacional de Periodismo José Martí (José Martí International Journalism Institute) in Havana. His photos have been showcased in various collective and solo exhibitions in Cuba and Spain, as well as featured on Cuban television. His photos have also appeared in several publications such as CubaCine, Opus Habana, El País, The Atlantic and Transition Magazine. Sergio is currently working as a photographer and field producer on They Are We, a documentary about the return of a group of Afro-Cubans to their ancestral home in Sierra Leone. He has also worked as a still photographer and camera assistance for several short films produced by the Escuela Internacional de Cine y Televisión (International School of Cinema and TV) in San Antonio de los Baños, and for other independent productions.